The procedure to place an implant is really not that difficult. It is actually taught at weekend courses throughout the country. The most critical part of an implant procedure is not the day of the surgery, but the diagnosis and planning that occurs before the patient is even given the appointment for surgery. Factors such as how the teeth bite together, what is the quality of the bone, is the patient a grinder, and many others determine the longevity of an implant. The surgery to place the implant has a >95% success rate. Although as soon as the crown is placed on the implant, the long-term success rate drops because the tooth is actually in use for eating. 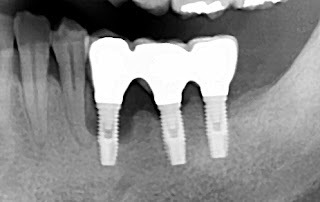 This x-ray is an example of poor treatment planning by not evaluating how the bite together. Over prolonged use the existing bad bite prior to surgery has created micro-movements of the left implant, which has caused bone resorption. Eventually it will lose more bone until it becomes loose and infected. Once that implant is lost, the same problem will start to affect the remaining implants.